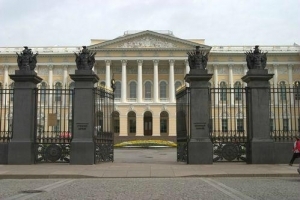 The State Russian Museum contains the world's largest collection of Russian fine art. It was opened on March 7 (March 19, New Style), 1898. The collections of the Russian Museum number over 400,000 exhibits. All genres and schools of fine, applied and folk art from the 10th to the 20th century are presented in the museum. The original interiors of the Mikhailovsky Palace harmonically supplement the exposition of the Russian Museum. The exposition of the Museum opens with the Ancient Russian painting department, where the visitors can see the icons by Andrei Rublev, Dionisiy, Simon Ushakov, as well as by unknown masters of Novgorodian and other schools of Russian icon painting. The department of the art of the 18th century presents marvelous portraits by A. Antropov, F. Rokotov, D. Levitsky, V. Borovikovsky. The department also features sculptural works by B. Rastrelli, F. Shubin, M. Kozlovsky, monumental canvases by A. Losenko. The museum contains an interesting collection of works of the first half of the 19th century. Among them there is «The Last Day of Pompeii» by K. Brullov, «The Brazen Serpent» by F. Bruni, «The Tidal Wave» by I. Aivazovsky. Wandering around the Russian Museum halls, one can get acquainted with the history of realism in Russian art of the second half of the 19th century as well. The visitors can see genre canvases by A. Venetsianov and A. Fedotov, landscapes by A. Savrasov and I. Levitan, historical paintings by I. Surikov, works by V. Perov, I. Kramskoi, I. Repin and many others. The artists of the end of the 19th century and the beginning of the 20th century are widely presented in the exposition. Among them are V. Serov, M. Nesterov, N. Rerikh, M. Vrubel, B. Kustodiev. The exposition dedicated to the painting of the first half of the 20th century presents the canvases of the artists of the so-called «Soviet school». Paintings, sculptures and plates present life of Russia in the 20th century. One can get acquainted with the works by V. Oreshnikov, E. Moiseenko, V. Muhina, M. Anikushin, V. Favorsky, E. Kibrik and others. The department of the modern art is the youngest in the Russian Museum. It was founded at the end of the 1980s in order to demonstrate new and far-out kinds of art, such as installation, video art, modern photographic art and so forth. This collection has been constantly growing. The collections of the Russian Museum also feature sculpture, numismatics, ancient applied art, prints. Annually the museum houses about 30 temporary exhibitions. 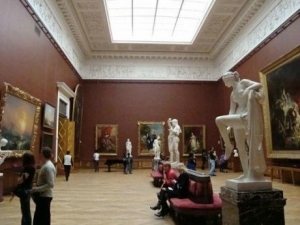 The Russian Museum occupies four magnificent buildings located in the center of Saint Petersburg. They are the Stroganov palace, the Marble palace, the Mikhailovsky (Engineer) Castle and the main building, the Mikhailovsky Palace with the Benois wing. The Mikhailovsky palace bears the name of its owner, Great Prince Mikhail Pavlovitch, the junior brother of Emperor Alexander I.